The Kildare IRA was heavily outnumbered by crown forces and had neither the manpower nor weaponry to seriously challenge them. With about 300 activists in County Kildare, and only about a third of them ready to take to the field at one time, they faced nearly 6,000 troops and hundreds of police and Black and Tans. However, the county was an important axis for intelligence gathering and communicati… ons to the south and west, and it is here Kildare made its greatest impact. The open flat plains of Kildare militated against ambushes, while its proximity to the capital also inhibited the Kildare Volunteers. Nevertheless there was a strong revolutionary element in the county. The book looks at the group of Volunteers who followed the railway track into Dublin to partake in the 1916 Rising and details attacks at Greenhills, Maynooth and Barrowhouse. 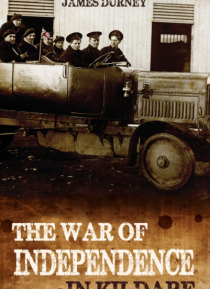 The author also examines the Rath internment camp in the Curragh, reaction in the county to the Truce and Treaty, and the eventual split in the republican movement in the lead up to civil war. This comprehensive account will be a valuable addition to literature on this formative period in Ireland's history.